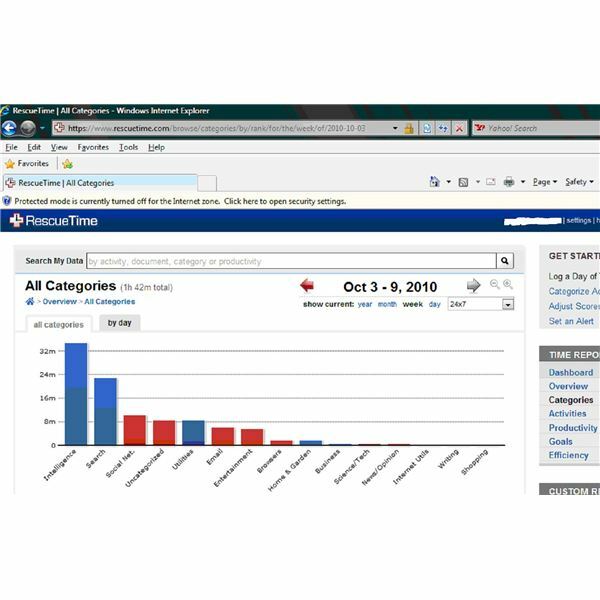 RescueTime is a time tracking solution that provides analytics on how time is spent on a Mac or Windows computer. It targets knowledge workers that spend most of the work day in this mode. The sections below rate the individual tracking programs: Solo LiteTM (the free version) and Solo ProTM (the paid version) with special notations when a feature does not apply to the free version. Additional information about the Team EditionTM is located in a separate section below. The installation process for this system could not be easier. In about 2 minutes a data collector is installed on your computer that tracks your every move. That is, it tracks which screen is in front on your computer and not idle for more than a few minutes. According to the company literature it captures "application name, web site URL (if the application is a browser), start time, end time, OS username, and computer name." The software that stores and analyzes the data is on the company's server and is considered software as a service. Finally, sign out of the website and begin going about your daily activities. At the end of the day, data is available on all the sites and applications you visited. Each site/application is associated with an activity (business, social networking, etc.) and has a productivity score (very distracting to very productive.) The most time-consuming part of setup occurs when you review this list for the very first time and decide whether you want to change the category or score for a particular website or application. If you bounce around to a lot of different sites (for example, doing research on the Internet,) then this can take quite a bit of time. 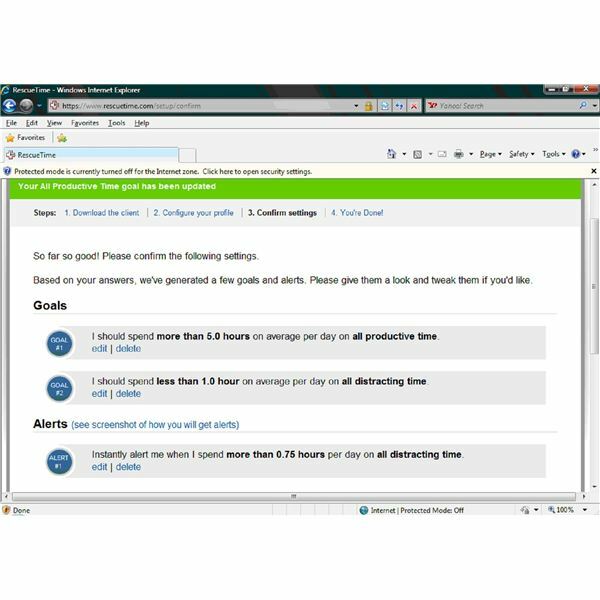 The screen shot at the left shows the screen that allows you to adjust the category and productivity score for a particular website or application. Each major category also has a subcategory. The main categories can't be changed. (A list of the main categories is shown in the screen shot above.) But, you can add custom subcategories. RescueTime has a solution if you visit too many sites and for others who want some privacy. It is called "whitelisting." Essentially, you list the websites that you want captured. You also have options to select the days of the week and times that are tracked. Once you have done the initial analysis and changed the settings to accomplish your tracking goals, you are done! Customization of subcategories (for the major categories) and the associated productivity ratings. A variety of charts and graphs to look at your activity and productivity. Reports automatically produced include an Overview, Categories, Activities, Goals, Productivity and Efficiencies. See selected examples below. Ability to create custom reports based upon key words. Ability to export, save and print data. Storage of data for 2 months (free version) or for life for the paid version. It’s free! You get a lot of information and you don’t have to pay a penny. The Solo ProTM version is $72 if you pay for one year of service upfront or $9/monthly. For a minimal monthly fee that you can cancel at any time, the paid service provides you with unlimited storage, detailed tracking of documents for applications, additional alerts and the ability to voluntarily restrict access to distracting sites. There is a 14 day free trial for all versions. The website contains video tutorials and instructions. In addition, there is on-line customer support via a forum and email. The company states that they will respond within 24 hours to questions. I posed two questions during the past week. In both cases, a response came back almost immediately. Reporting for the whole team and individuals. Ability to manage by groups with different priorities. Automated project tracking based upon keyword use. The price for the Team VersionTM varies based upon the number of seats being tracked. For example, tracking 2 seats is $24 and tracking 100 seats is $640. There is a free 14 day trial for this version too. It seems that I’m not the only user that had some concerns about computer security. 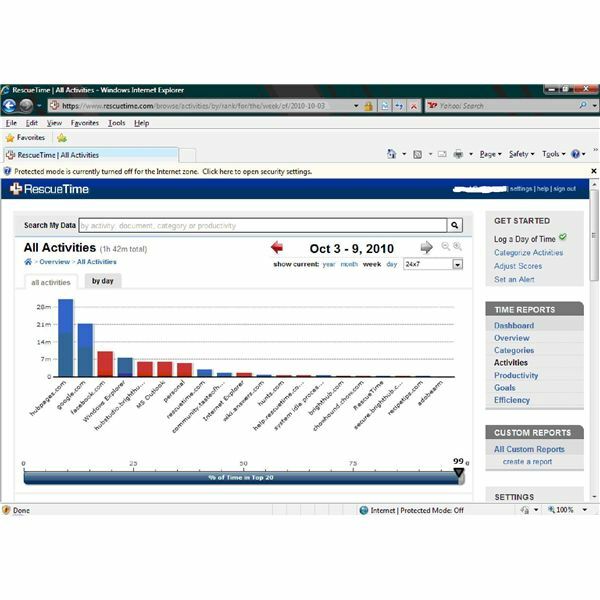 The company published a white paper addressing RescueTime security. Note that the company has been around since 2008. Once you get past the feeling that someone is always watching you, RescueTime provides a great deal of information for a person that spends time on the computer. Can you fool the system? Of course! Just because you have a document or website open, does not mean that you are working effectively. But, for the person who honestly wants to understand their work habits, I would highly recommend it. It provides an effortless way to track activity that might otherwise be prohibitive to capture. Visit the RescueTime website at https://www.rescuetime.com/. 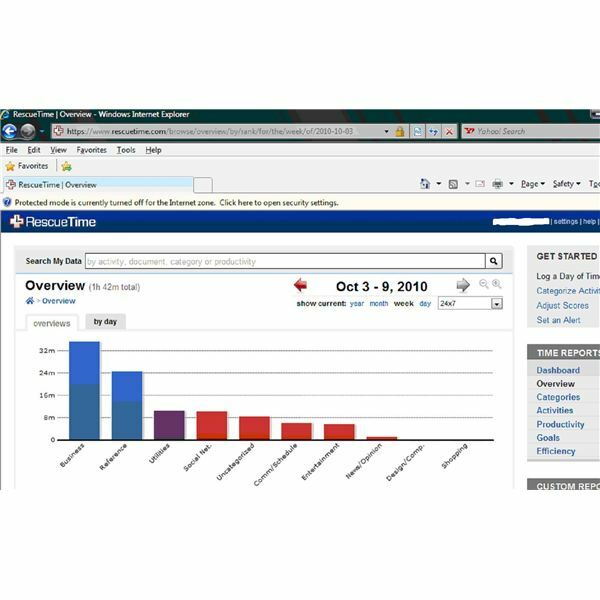 Screen shots taken by Marjory Pilley and provided by RescueTime.